I'm pretty picky with who I trust my teeth with, but I thought Dr. Kopach was wonderful! She is verywarm and personable; took the time to answer all my questions and most importantly has a gentle touch with procedures! Will be making her my regular dentist going forward. I'm pretty picky with who I trust my teeth with, but I thought Dr. Kopach was wonderful! She is very warm and personable; took the time to answer all myquestions and most importantly has a gentle touch with procedures! Will be making her my regular dentist going forward. It was my first visit to see Dr. Kopach. I was going to get a teeth cleaning/routine exam. The wait timewas minimal and the staff were all very polite and friendly. The initial paperwork wasn’t lengthy like at some offices and I was quickly seen for X-rays. During the cleaning, Dr. Kopach greeted me kindly and got right to work. She was knowledgeable and helpful. She took time and asked if I had any questions or concerns and gave me advice on how to save money (I grind my teeth and she said for me to try a night guard from the store before getting one molded there). However, double check to make sure your insurance is in their network. Zocdoc said we were in network, yet once my husband finished his X-rays he was given the breakdown and we weren’t in network so we paid quite a high fee that we weren’t expecting. Nevertheless, the man at the front desk was helpful & spoke to the Doctor to lower our fees for follow up fillings, which was really nice! I definitely recommend others to come here for teeth cleanings, etc. you’ll feel welcomed and comfortable and get the service we all want/need from a dentist! It was my first visit to see Dr. Kopach. I was going to get a teeth cleaning/routine exam. The wait time was minimal and the staff were all very polite andfriendly. The initial paperwork wasn’t lengthy like at some offices and I was quickly seen for X-rays. During the cleaning, Dr. Kopach greeted me kindly and got right to work. She was knowledgeable and helpful. She took time and asked if I had any questions or concerns and gave me advice on how to save money (I grind my teeth and she said for me to try a night guard from the store before getting one molded there). However, double check to make sure your insurance is in their network. Zocdoc said we were in network, yet once my husband finished his X-rays he was given the breakdown and we weren’t in network so we paid quite a high fee that we weren’t expecting. Nevertheless, the man at the front desk was helpful & spoke to the Doctor to lower our fees for follow up fillings, which was really nice! I definitely recommend others to come here for teeth cleanings, etc. you’ll feel welcomed and comfortable and get the service we all want/need from a dentist! Diana Kopach is a general dentist serving patients of all ages in Kew Gardens, NY. Dr. Kopach specializes in preventative dentistry, restoration, reconstruction, rehabilitation with holistic aproach. 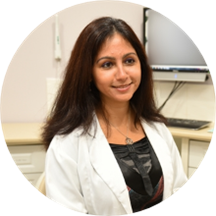 Her goal is to provide her patients with exceptional dental care, while maintaining a minimally invasive approach. Dr. Kopach provides her patients with all aspects of general and cosmetic dentistry, ranging from emergency visits to full mouth reconstruction. She is also certified in Invisalign and is happy to offer this service to her patients. Dr. Kopach attended New York University Dental School to earn her dental degree. She then completed her general practice residency at the Jamaica Hospital in Queens, NY. In her spare time, Dr. Kopach enjoys to read, teach dance, attend meditation retreats and actively pursue a holistic lifestyle. Very friendly, knowledgeable, and made feel comfortable despite my embarrassment on what needed to done with my teeth. I hate going to the Dentist. It’s intimidating and honestly they can be rough with your mouth. I’d developed a fear of even getting my teeth cleaned. Fortunately, I found Gentle Dental on Zocdoc! Everyone is kind and helpful -from thereceptionist down to the radiologist. Doctor Kopach and the Dental Assistant, Chris were very sweet, patient and gentle with my deep cleaning. All my nerves went away as they both worked on my mouth. I will be returning to replace old filings and for my second cleaning. Oh, and all machines are technologically advanced! Check them out! You won’t regret it! Dr. Kopach was absolutely fabulous as was her assistant Chris. Not only were they both amazing but the entire staff in the office is wonderful and made you feel beyond comfortable! ! For someone who hasn’t gone to the dentist ina few years I’m definitely not nervous to come back! The staff at the office are very friendly. They explain every detail, and they even give you some awesome advice to keep up with your teeth. I’m honestly happy and I found myself a new dentist. Everyone was very professional and friendly. The quality of their work is excellent. Very satisfied, will definitely recommend. Her staff members are very kind and attentive, they all sat and explained in detail what should be done and how we could all come up with a plan that benefits me and are willing to work with me not manydentists go with her approach a lot of them are so focused on the money they forget about the relationship with the patient. She just gained a new one!! Dr. Kopach is amazing. I came to get a tooth extracted and she explained everything to me. She was very gentle and I had no pain at all. Her assistant, Chris, was equally as helpful. I highly recommend you seeing Dr. Kopach if you’re looking for a dentist. They made me feel very comfortable, communicated what needed to be done and let me know what they were doing with every step. Went in for a deep cleaning, albeit a tedious process, she was pretty gentle! Staff was also amazingly courteous and very helpful. Definitely one of my better experiences with a dentist.